In visual Studio 2012, Microsoft released a very handy feature of auto previewing a file as soon as you select the file in Solution Explorer. However, this feature may become annoying at some scenarios. In this post, we will see few ways of disabling the same. 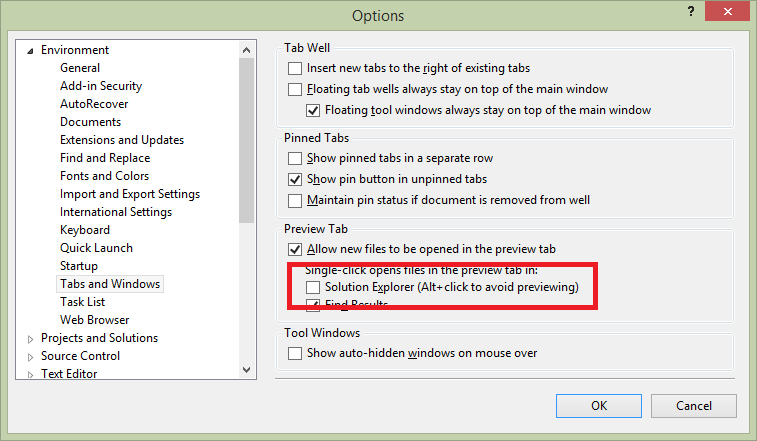 Go to Tools > Options > Environment > Tabs and Windows and uncheck the “Solution explorer” under Preview tab. Click the icon from within Solution Explorer that says ‘Preview Selected Items’.